Age you entered trade and how. 19 yrs . I had a want to be a Television Camera Operator and worked as a Telecine Operator (behind the scenes) when I left school. I soon discovered the cameras carried on the shoulders were all right-eyed cameras and I use my left eye due to partial blindness. Wanting more than my job gave me, I was chatting to my mechanic and he just came out and offered me an apprenticeship. He stated that the last 2 apprentices 'got their girlfriends pregnant' and was seeking another. We laughed as I promised him I wouldn't get my girlfriend pregnant knowing I was heterosexual. This was 1987. I always hung out with my brothers and we all helped Mum and Dad with building additions onto our homes and fixing things. Dad is such a handy man, and worked in the RAAF as an Airframe fitter. I saw that the trade would give me an opportunity to develop skills that I had never thought of. Trades were not an option for women back then. Being the 2nd women in the ACT to do an automotive apprenticeship and the first in 10 years I was a novelty. I was seen as the laughing stock of the industrial area and many long time mechanics in the working district told me I wouldn't make it. I faced verbal backlash telling me I was taking a job away from a young male who should be have the apprenticeship. I also had to deal with the young immature males at TAFE who did not know how to interact with women, let alone a head strong one. I faced sexual harassment where I was pinned down on a stair case by a slimy car salesman. The perpetrator very shocked to receive a knee in his crutch so hard his walked with a limp for a very long time. I also started my time when the TV show neighbours had Kylie Minogue as the local mechanic which gave guys something to leverage off. However overall, the support I received from those that mattered being my family, friends, boss and TAFE teachers and friends was encouraging. The support from those outweighed the threatened minority. Having always been very independent, determined and a tenacious person helped me through the tough times. Being an older apprentice (in those days I was considered an old apprentice) and having worked previously in a full time job, I was mature enough and able to handle myself in various situations. The support of my parents, both my brothers and grandparents was amazing. I also had the support of the ACT Apprenticeship Board. Back then, the Apprenticeship Board interviewed every person who wanted to be 'indentured' as an apprentice and I signed a binding contract. The Apprenticeship Board dealt with all training, employment and Industrial Relations issues. They visited the workshops and TAFE on a regular basis making sure apprentices were getting trained, being treated right and attending TAFE. Their presence mattered. I really am proud of my many achievements I have accomplished in my life. I'm really proud of my parents for bringing me up in a very positive environment with the motto - 'feel the fear and do it anyway!!! ' Which I have lived by. Completing my Apprenticeship was a very proud moment. I am proud to have worked using my trade skills and continue to do so in my career. I'm proud to have been the first female mechanic working in the 'pits' in the ACT as a vehicle inspector when the ACT Government conducted annual vehicle inspections. I am really proud to have switched from the white collar world in 2005 as I was restless and in need of physical work activities back to the blue collar world which took 3 years and additional skills training. And I am very proud to have been promoting trade options to women of all ages since 1992 though Tradeswomen on the Move project, Tradewomen's Association of the ACT and through SALT and my every day work. The fact that a trade gives you flexibility to be able to transition between industries and jobs. I started out as a Motor Mechanic. After a vehicle accident when I had to learn to walk again, my trade allowed me to work for the ACT Apprenticeship Board to assist and help apprentices as a trade qualification was a prerequisite. I moved through the New Apprenticeship System as a Business Development Officer to Operations Manager and with a move to QLD I decided to transitioned back to the Blue collar world through additional training. 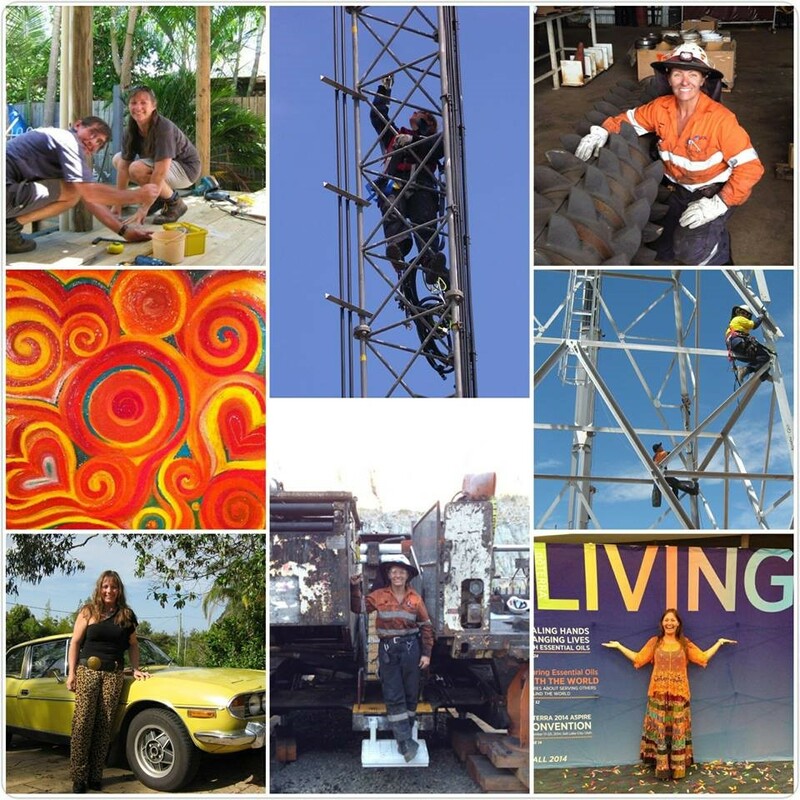 I soon secured work as the first female telecommunications Rigger in Australia at the age of 38, climbing towers up to100+ meters upgrading mobile phone networks. My manager told me he had many applications but I secured the interview because I had a trade. When the GFC hit in 2006/7 and telco work stopped, I up-skilled my self again and secured work with a crane company as their intermediate rigger, mechanic, and truck driver for the crane counter weights. 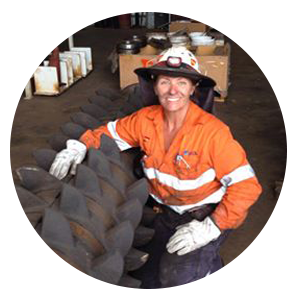 At the age of 43 I secure a job in the Qld coal mining industry as a Mechanical Fitter because I has a motor mechanic trade qualification and as a Rigger working in coal processing plant on fixed plant and on Drag-lines, often as the only female on the job. And until recently I worked for about 10 years, 1 – 4 days a week, having a long weekend every weekend and being paid great money for a great lifestyle, a bonus. The feeling of real achievement. To be able to use all my skills and apply it to all work circumstances and succeed. To complete a complex a task within a specified period of time using mental and physical exertion, in a great team environment. Being paid to go to the gym oops work, every day and enjoy the job. And meeting interesting people. My proudest triumph: A CQ mine site required very large angled pipe to be removed from the side of the coal wash plant 20 meters up using a 100t slew crane and I was the only qualified rigger to do the job and the only one with an EWP ticket. The site had never had a female as a mechanical fitter nor rigger. I had another fitter with me in the EWP. Every mine site superintendent, operations manager, supervisor and plant operator available were standing at eye level to myself at the 20 meter level on a walkway waiting and watching with bated breath. The pipe had to be secured using angle pipe rigging techniques and a cumbalong. I had to make sure that pipe did not move when the last bolt was removed and the crane had the load. I took control of the whole situation using 2 way radio, hand signals, instructing the fitter assisting and air tools. The lift could not have been more perfect. I was then the identified Rigger for my company on that site from then on. A great Triumph. More women were working on that site from that day on. I work on my Triumph Stag sports car. I love the beach, sun, summer and surfing.